It’s easy to start explaining marriage reality to your family and friends with the language of reality and concrete action at all levels of society. Here’s what’s happening in the media and at the local and national levels to take back marriage. Want to get involved? Click on an event for more information. You’re not powerless – you can help reintroduce marriage to the culture starting with your own family, circle of friends and parish today! Here are some easy ways to start. 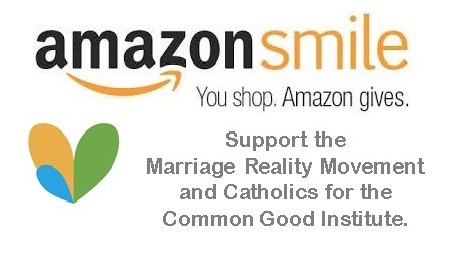 Distribute marriage reality educational pamphlets in your parish or organization. Download free pdfs for signs and banners and find other materials by selecting the Resources button below. Organize study groups or propose a study series in your Bible study or faith sharing group with marriage reality study pamphlets, book and video. Many people organize little groups in their home with friends. Gain personal insights for planting seeds of verifiable truth (reality) to help change perspectives on love, marriage and family by using and exploring the “Quick Reflections” and "Go Deeper Articles" buttons below. Studying and reflecting on Marriage Reality materials will help you and others learn to approach subjects related to marriage from the perspective of the child. You will learn to spot underlying false premises that most of us unwittingly accept and undermine our ability to communicate the truth. With these insights you will start becoming ready to begin evangelizing to your family and friends without conflict. And watch for opportunities in the future to go even deeper, connect with others in the Marriage Reality Movement and participate on a larger scale. Join the Marriage Reality Movement today to receive our newsletters, special offers,the latest news and exclusive opportunities to learn more about becoming a marriage reality evangelist and defend the rights of children. There's no obligation, no membership fee, no experience necessary. Just a desire to make marriage once again a privileged institution that unites children with their mothers and fathers.